I’ve been feeling it for a while – something gemütlich is in the air and it’s not just Sacher torte and Tostmann Trachten. A focus on Austria seems to be making the rounds. This week T Magazine shared an amazing art collection in a 17th century Austrian Manor and Travel + Leisure explained why “Food is reason enough to come to Vienna in winter.” So since I don’t have a visit to Vienna scheduled in the immediate future (although I’ve discovered some designer friends do), the next best thing was obvious. An outing to the Neue Galerie to scout holiday gifts was in order. The shop at the museum is a jewel box of a space that packs a powerful design punch within its small square footage. 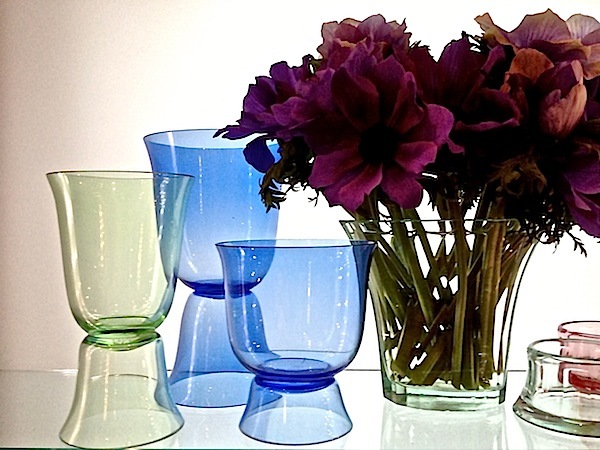 Its line, Neue Haus, produces objects based on original Biedermeier, Vienna 1900 and Bauhaus designs. And Director Renée Price oversees creative collaborations with designers, artists and artisans here and abroad, yielding original pieces inspired by objects in the museum’s collection. It is a sophisticated and stylish source for the exquisite and unique. In the age of computerized missives, a hand written note is still an appreciated touch. 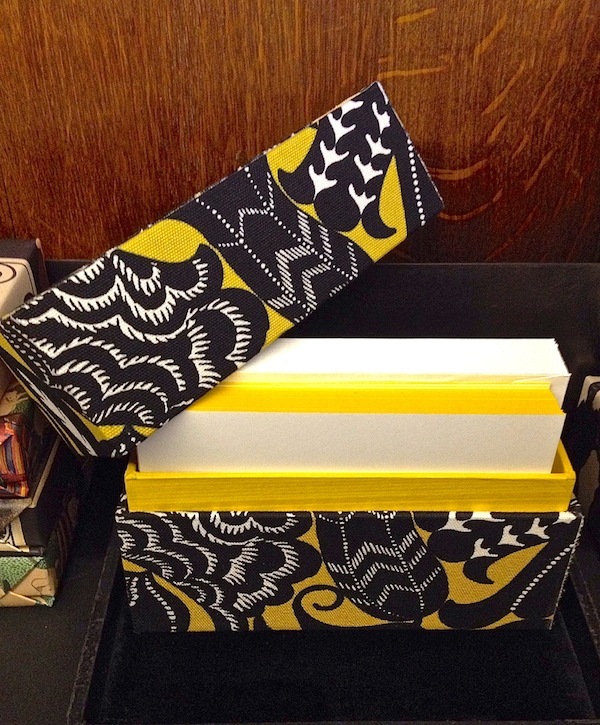 Covered in handcrafted fabric from a Dagobert Peche textile design from 1913, this chic correspondence box is produced by the distinguished Thornwillow Press for the shop. A lesser known star of the Wiener Werkstätte, Peche’s work was one of the first exhibits held at the museum over ten years ago. 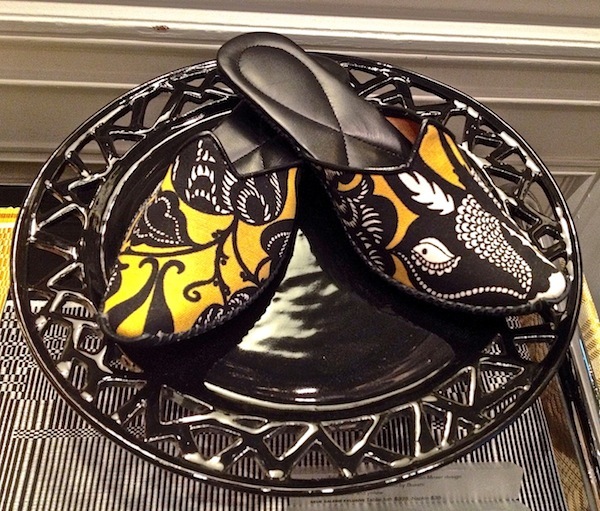 The same textile is transformed into these fabulous Aladdin slippers. Handmade with with suede and leather, the Pasha heel will have you feeling like Ottoman royalty when relaxing at home. 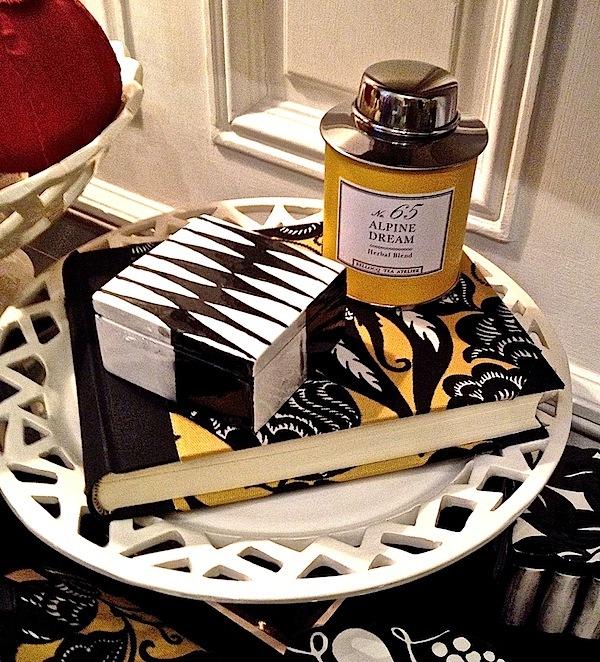 The bold ceramics of Dagobert Peche inspired Frances Palmer‘s ceramic cake stand underneath. Here Frances’ cake plate in white with her harlequin charm box, a guest book hand-bound with the butterfly fabric featuring archival vellum pages and Alpine Dream Tea, a hand-crafted herbal blend inspired by the Tyrol, developed exclusively for the shop by Bellocq Tea Atelier. Serve your tea Viennese style in Ena Rottenberg’s amazing Orient bone china service. Designed in 1930 and produced by Augarten, the set includes four heads representing the coffee and tea-producing areas of Asia and Africa. 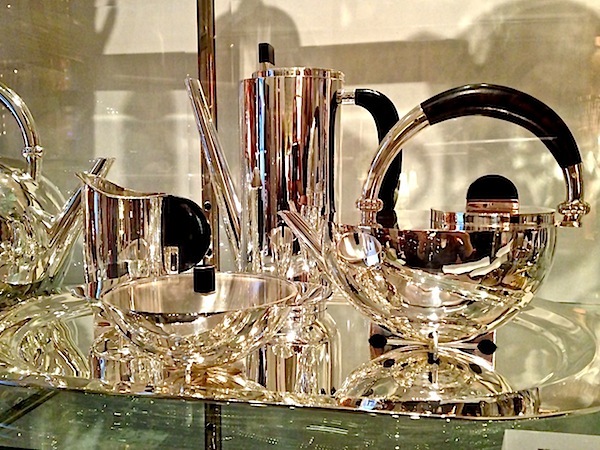 For more formal affairs, there is Marianne Brandt’s stunning sterling and ebony tea set, designed in 1924 and produced by Alessi. 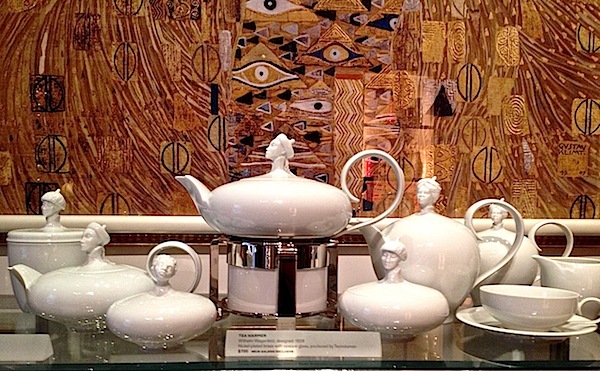 And if coffee’s your beverage of choice, Josef Hoffmann’s Mocha service from 1925 looks amazingly fresh and contemporary. 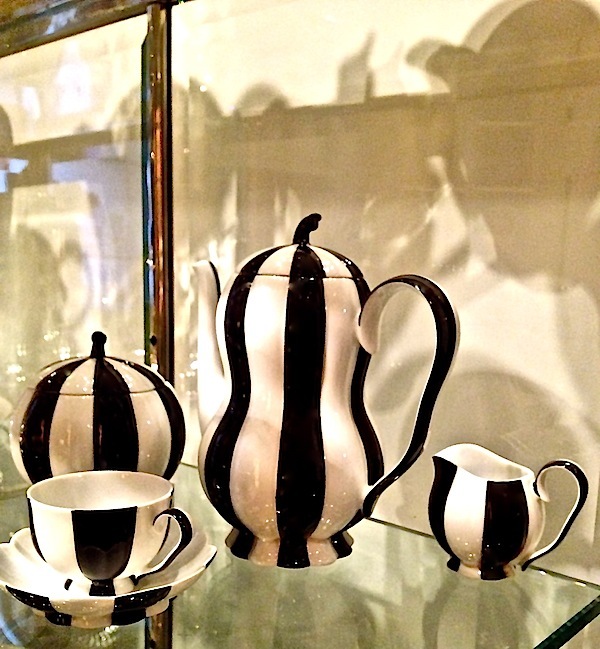 Produced in black and white porcelain by Augarten it is also available in combinations of black, cobalt, gold, rose and white. 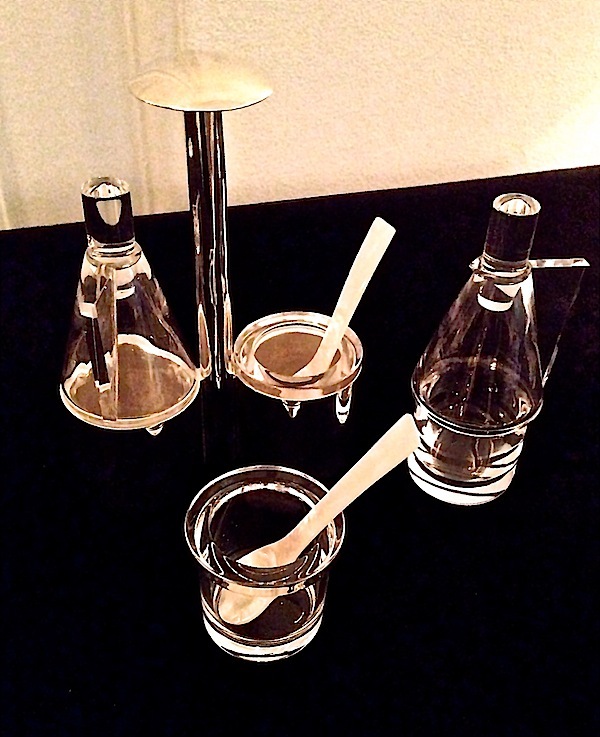 Also by Hoffmann, this elegant silver cruet set becomes even more versatile with the interchangeable condiment, salt/pepper cellars. The timeless integrity of Hoffman’s designs is seen in his crystal, with its refined sensuous lines,equally at home in contemporary or traditional decor. 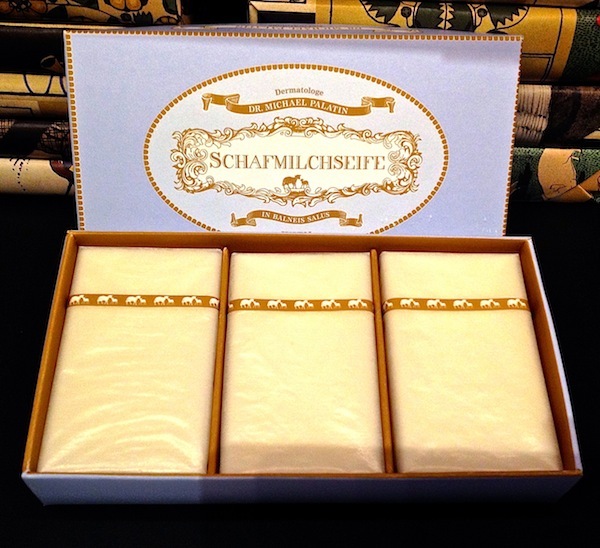 With charming old world packaging, this set of all-natural sheep’s milk soap, developed by a Viennese dermatologist in conjunction with an artisanal Austrian soap maker, is a perfect gift for a holiday hostess (purchasing an extra set for home is always a good idea)! 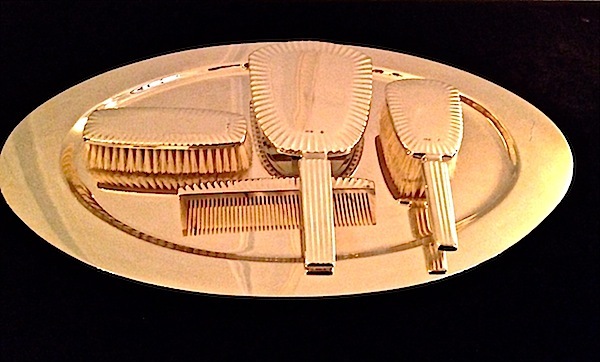 And for elegant preening, Oswalk Haerdtl’s silver vanity set is an heirloom to be treasured for future generations. Neue Hund is the shop’s line dedicated to the fashionable dog, inspired by Milly von Barksky, Ms. Price’s miniature Schnauzer. Above, Milly shows off her Loden coat designed by Han Feng. Available in chocolate brown as shown or linden green Austrian loden, it is lined with Hoffmann’s colorful Riva pattern. With a tailored kick pleat and belt with woven leather buttons, even the most discerning pooch will be barking in style. And Milly travels with style in her leather carrier produced by R. Horn’s Vienna. Hand-sewn of chocolate brown calf-skin, it can be carried by its hand-stitched leather handles or woven shoulder strap. 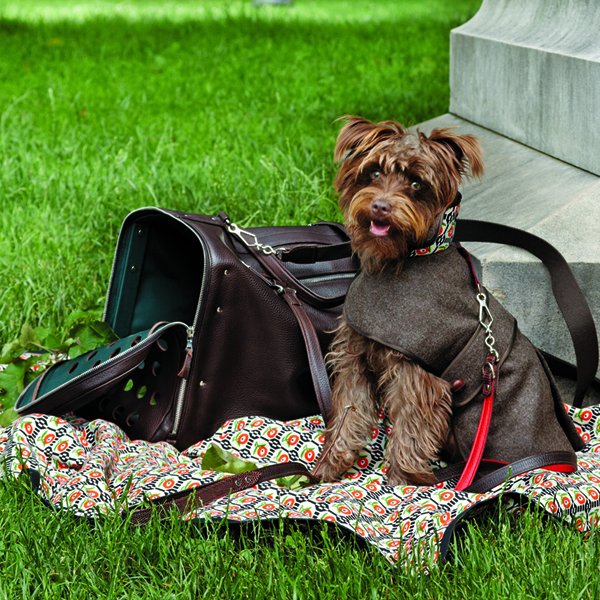 Nickel-plated hardware and a washable forest green nylon lining make it not only chic but practical for any traveling pet up to 20 pounds. 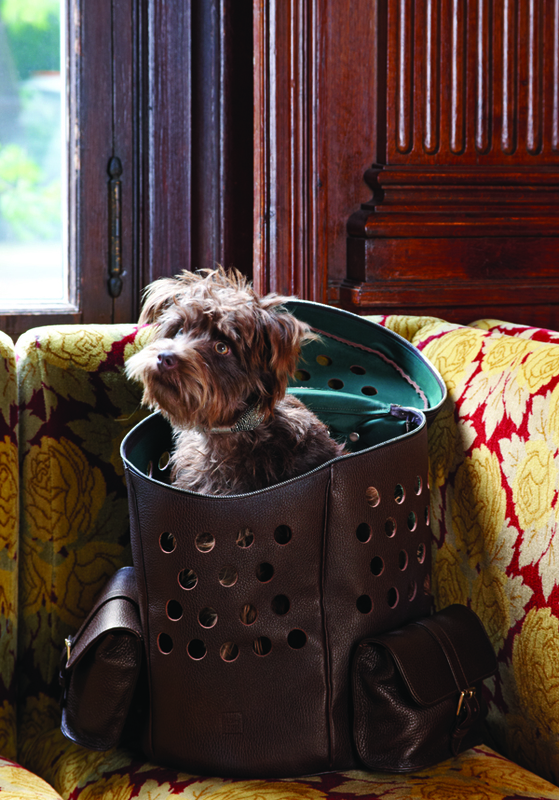 Milly sits comfortably in the Rucksack in the museum’s Café Sabarsky. With all the same versatile handcrafted features as the carrier, outside pockets are perfect for water bottles and snacks, which the museum of course offers. 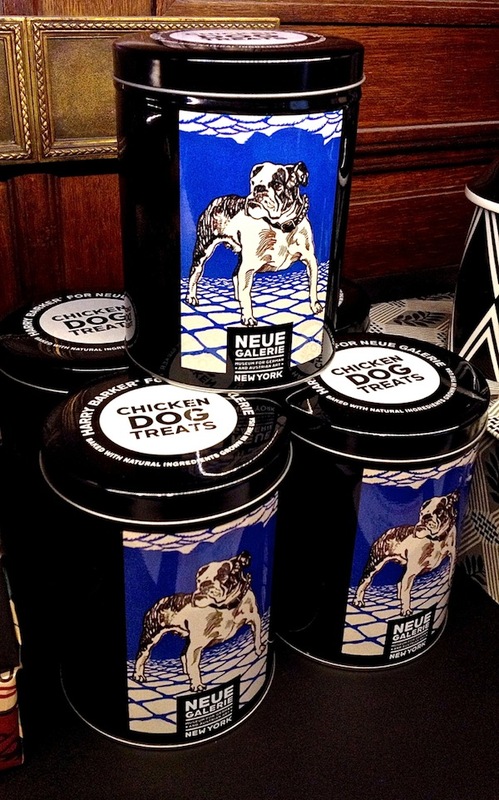 Produced by Harry Barker for the Neue Galerie, the chicken-flavored biscuits are baked in the USA with all-natural ingredients, in appropriately Secessionist tins. This is just a small selection of the beautifully curated and produced products available at the shop. Next time I visit the museum, it will be to see the Kandinsky exhibit, on view through February 10. Including over 80 works, the exhibit is a multidisciplinary show connecting art, music and theater. 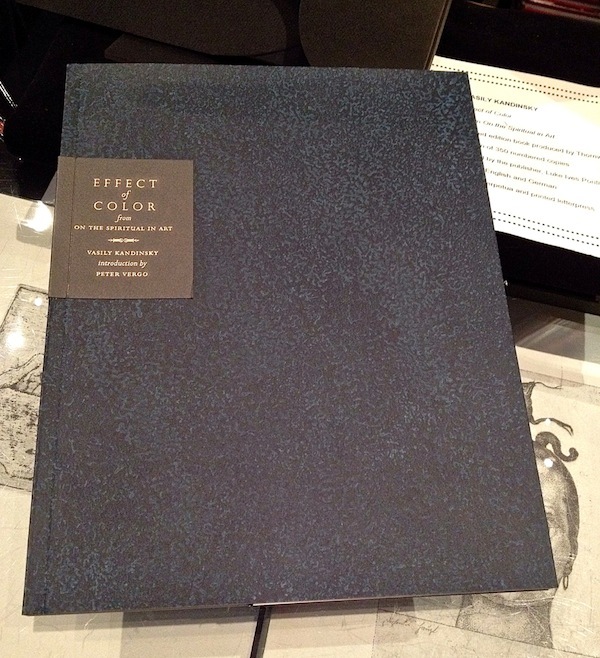 The Effect of Color, above, reprinted from a larger work by the artist, is produced by Thornwillow in a limited edition of 350 copies, signed by the publisher. For those of you visiting the city during the holiday season, a visit to the Neue Galerie (and of course the design shop) is highly recommended. Until I can get back to Vienna, I’ll be getting my fix at the Neue Galerie. This entry posted in design, gifts, interior design. Entry Tags: Austria, Design, Gifts, Neue Galerie, NYC Museums, Vienna Bookmark the permalink. 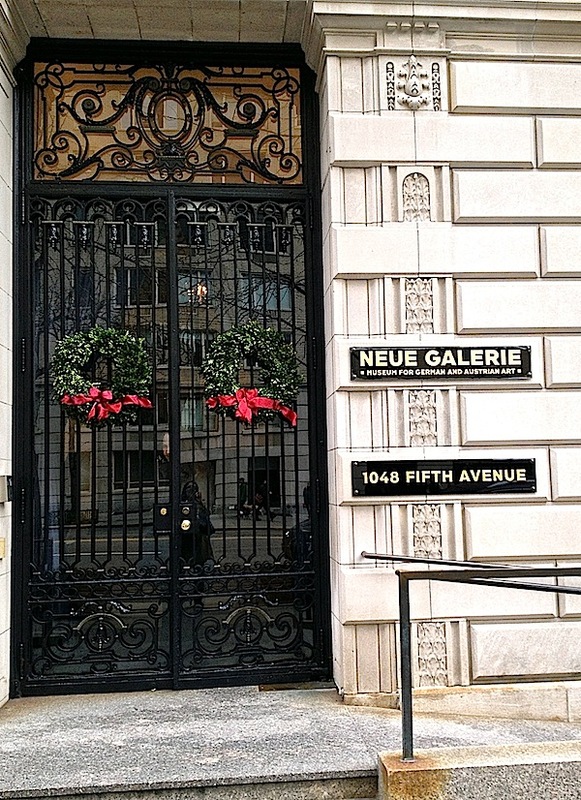 I love, love, love the Neue Gallery – no surprise that they have fantastic holiday gifts. A trip to Vienna would be just the ticket. Have a lovely weekend! What wonderful unusual collection of gifts, the black and yellow stationary and slippers are so fun and refreshing, I love yellow. The dog coat is exquisite! Sadly, I believe my pooches would destroy it before you could say “Happy Holidays”! The Neue Galerie is always my first and last stop on any visit to New York. In fact many of my trips to New York from London are planned around exhibitions at the Neue Galerie. The bookshop and the gift shop are caverns of exquisite delights. The catalogues in their gleaming black covers with gold titles line my bookshelves and the superb objects from the design shop dress my table. Today is Christmas and I am cooking a recipe from the Neue Galerie cookbook. 78 queries in 0.440 seconds.